I took this photo last night on top of the Musée d'art moderne de la Ville de Paris (the Paris Modern art museum) on my way back home from having dinner with my father. Call me ignorant, but I have no idea what this big sign means. Is that a brand, the name of an exhibit, a new Republic?! I looked up on the web, and found nothing. If someone knows, please, enlighten us! 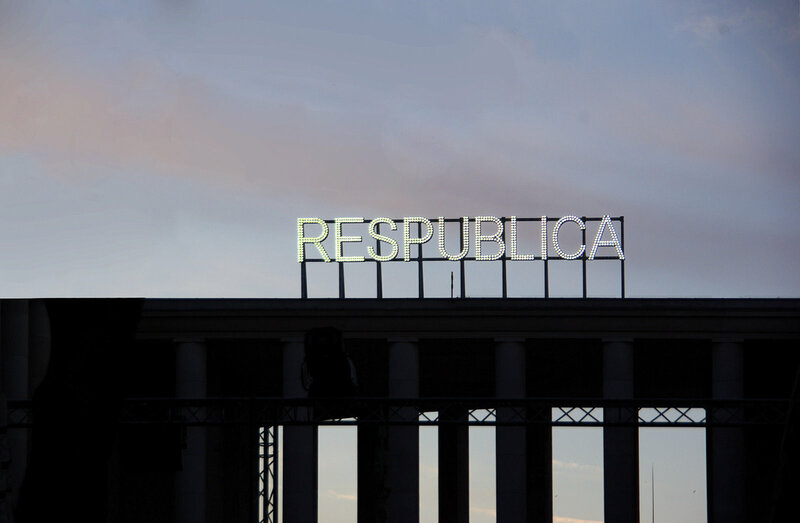 "Res publica", translated literally from Latin, would be "public thing". 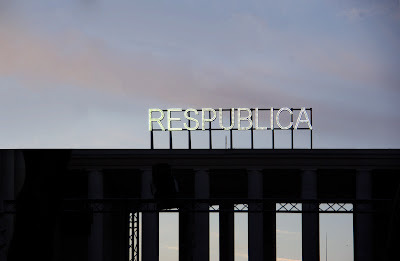 Here is what Wikipedia says: Res publica is a Latin phrase, loosely meaning "public issue" or "public matter". I tried to visit that museum, but it was closed. They probably had not yet repaired their security system. PDP is sort of a res publica! Once again you've created a wonderful image, Eric. Bravo!! I suppose Res Publica could also be the name of a competition that any runner in the country could enter!!! Another definition of res publica is "the general good or welfare." Whatever it means here, I love the graphic nature of this photo! Good post...great photo with lots of interesting viewer participation. Yes, whatever the mystery, it has made for a lovely photo. The silhouette and typography are beautiful, Eric! or, it could be the new name for the French football team as the government tries to distance itself from the fiasco at the World Cup. Someone sent me a link. I have no time to read through it (and it's all in French!) but the sender said "This site should provide you with all the answers about this sign on the Museum". in my opinio Jeff is right. As a lawyer here in Brazil I use this expression a lot in my daily work! They also wish to promote and protect the French language as part of a multi-lingual and diverse world. The website is in French (of course) so I hope that I got this right. Still don't know what it's doing on the Museum of Modern Art. This would probably be too easy, but...someone could go to the musée and ask. It's a work of Nicolas Milhé exposed the first time in Bordeaux in the arts festival and urban EVENTO. I pass by this daily on my bus route. A day or two after this image posting, they held a basketball event of some sort. I seem to recall that the sign remained. Not sure whether it was connected. Have no idea what it is but I do know it is very seedy at night! The walls leading up the stairs are covered in graffiti, the pond in front has trash in it. Felt like a bad neighborhood.